Delaware is the state that started it all. The home of the legendary ride of Paul Revere and is chock full of American history to discover. The First State has some nice accommodations for your RV trips as well from the rural life to the beach life – the smallest state packs a punch for those looking to get away from it all to kick back and relax. Let’s look at my top five favorite RV parks and campgrounds so you can enjoy the beauty of this small wonder of a state. With over a thousand sites, Treasure Beach RV Park and Campground is a small city upon itself nestled right next to Ocean City. Treasure Beach also has all the amenities you would expect of a park with over a thousand sites, including your basic utilities as well as cable TV. There are bathhouses, spacious laundry facilities, propane fill-up, convenience store, even a skate park. You can spend time in the clubhouse or the arcade, lounge around the pool or enjoy one of their craft shows in July. The fun and activities of Ocean City and Fenwick Island are right around the corner so that you can enjoy fishing, crabbing or fine dining and shopping. If you to walk in history, then take a few steps down the beach of Cape Henlopen in Lewes. The patriot William Penn declared the beaches of Cape Henlopen a public land in 1682, nearly a century before the Declaration of Independence was signed. The State Park doesn’t have any electrical hookups, but many of the sites do come with water, all situated on pine-covered dunes. There are showers and a dump station available. Enjoy the beaches of America’s forefathers and scout for rare bird species. Explore the Seaside Nature Center and its five 1,000-gallon tanks, interact with the exhibits and look at the Osprey Cam. Cape Henlopen is also the eastern terminus of the American Discovery Trail if you’re ready to start on the 6,800-mile journey. If you’re looking for somewhere to stay for a few nights or a few months on the Atlantic shore of Delaware, then Leisure Point Resort is the place for you. Shaded campsites offer your full amenities such as electric, water, sewer, and cable TV. There are plenty of amenities and activities, such as basketball courts, showers, volleyball, and a clubhouse. You can also enjoy some activities that are specific to the Delaware coast such as fishing, crabbing and clamming. Bring your boat or rent one to put on Leisure Point’s 319-slip marina. With these facilities and activities, Leisure Point has been awarded five stars by Coast to Coast six years running. You might not picture wetlands as part of Delaware’s landscape, but Trap Pond State Park is over 2000 acres of shallow ponds and bald cypress trees. The grounds provide 130 sites with electric and water hookups. There are dump stations, showers, playgrounds, picnic areas, and a boat ramp so you can put in. There is plenty of hiking trails around the area for you to explore the wetlands and surrounding area. Take the boat out for watersports, fishing or trolling around Trap Pond. You can also rent canoes, kayaks, and pedal boats to explore the swampy waters. Trap Pond is also excellent for bird-watchers, hosting herons, warblers, owls and much more, guests have even been known to spot a bald eagle on occasion. Thousands of visitors a year flock to Rehoboth Beach year for the sights, sounds, and fun of Rehoboth Beach. Delaware Seashore State Park gives you an upfront experience with this wonderful Delaware Beach. The State Park offers sites year round, during peak season, April through November, you can enjoy full service with water, electric and sewer hookups. They also provide showers, laundry, and vending machines. 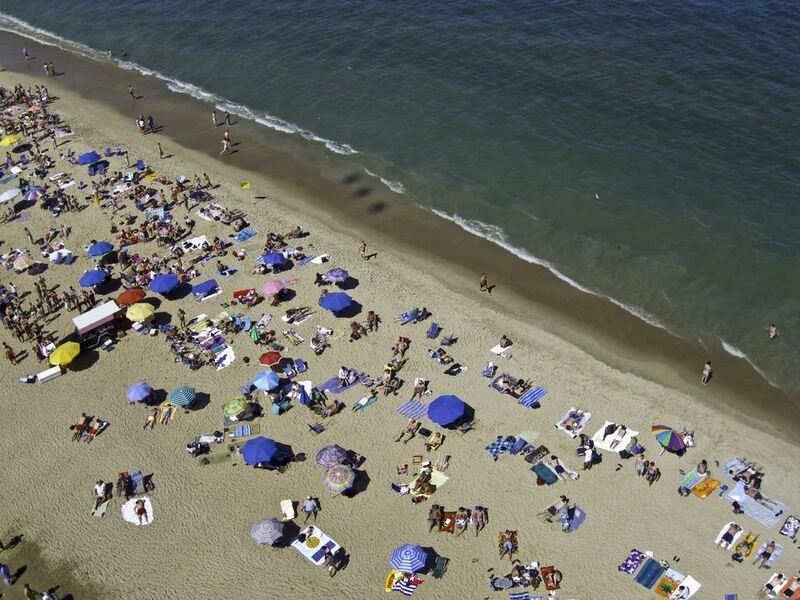 Enjoy your days and nights with all the activities Rehoboth Beach has to offer. Enjoy the sand between your toes or do some people watching on the boardwalk. Check out the Rehoboth Beach Museum with rotating exhibits or enjoy some of the city parks. Try to get there in late October to enjoy the fun of the Sea Witch Halloween Festival. Delaware may be the state where residents claim to get from one end to the other in under 20 minutes, but there’s plenty to do for RVers, especially during summers if you love the beach, tax-free shopping, and getting away from it all.